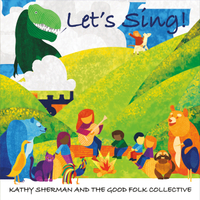 This is a fun, multi-generational, sing-along album containing playful "Good Folk" songs, along with a dose of sly humor. Something magical happens when children and their grown-ups sing together; it's a bond, a memory created, that lasts a lifetime. The music from "Let's Sing!" as well as my other two children's albums with my group Hey Mom!, "Listen to Your Mama" and "Singing on a Star" are tried and true folk songs that families will love. These songs help create enduring, shared musical experiences that connect generations.